An invisible set diamond setting can be a unique and beautiful choice for an engagement ring, wedding band, or any jewelry. Whether it be a wedding band, or a diamond ring, the invisible setting gives a ring unique beauty. Click on the 'buy now' link at the bottom of each image for purchasing information. With several small stones closely set to give the impression of a larger gem, invisible settings are often more economical than single large diamonds, and they are a versatile type of ring setting that can be found in many beautiful designs, including faux solitaire rings. Multiple diamonds are often invisible set into elaborate diamond bands that can be unique wedding bands or unusual engagement rings. Adding precious metal edging to the ring enhances the illusion of a larger center stone and adds color and distinction to the ring design. Invisible set diamond setting rings are popular for men's engagement rings because the diamonds can be flush with the ring and more protected. Multiple rows of stones can also be used for a wider band suitable for a man's larger fingers. Invisible set diamonds are easy to arrange in symmetrical art deco patterns that include angled gems and open spaces. This can be a stunning type of elaborate engagement ring or a unique right hand diamond ring. 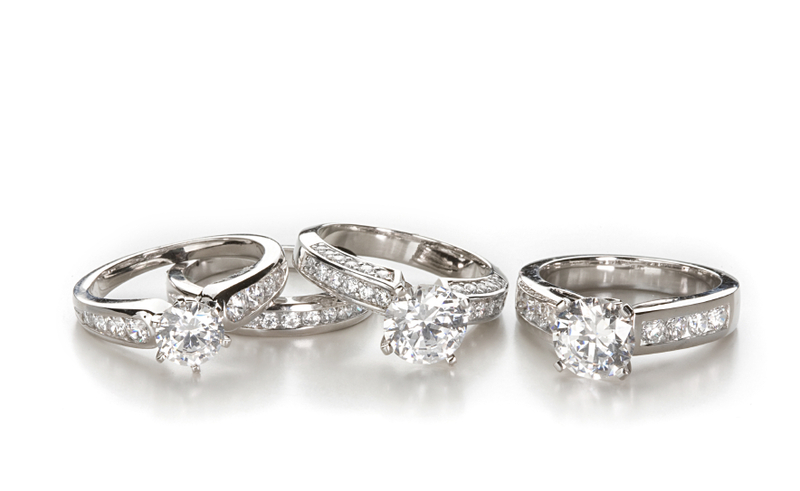 Invisible set diamonds are a popular choice for wide wedding bands. Instead of pave set wedding bands where the diamonds are more exposed, the invisible setting with channel edging protects the gems without diminishing their beauty. Princess cut diamonds are popular for bridal set engagement rings, and choosing an invisible setting gives the diamonds a pave look without gaps or cracks between each gem. This also allows both the engagement ring and the wedding band to fit closely together for a smooth, coordinated set. Varying the size of stones in invisible or illusion settings can add more texture to the ring. Using smaller stones, in particular, will give even a wide band more delicacy and sparkle. The key of an invisible set diamond setting is that the prongs or metal holding the diamonds is not visible. Scatter settings with flush set diamonds are a unique way to accomplish this and can be more economical because they use fewer stones to cover larger surface areas. While the most popular diamond shape for invisible settings is the princess cut because the square stones will fit easily together, other diamond shapes can also be used. Round and baguette cut diamonds are popular and mixing the cuts can give a ring more unique texture. Not all invisible set diamonds are square or rectangular. Smaller round cuts can be combined to create a larger faux round cut diamond with a much bigger diameter than could be affordable with a single jewel. Semi precious gemstones can also be set invisibly to create the illusion of larger gems. Colored gems, such as rubies, sapphires, or emeralds, can be surrounded by invisible set diamonds for a halo ring with a burst of stunning color. Large diamond stud earrings don't have to be just one gem; they can be invisible set diamonds as well. By using more than one stone, the earrings will have more sparkle and be more noticeable even if they don't have a larger carat weight. Of course, they are the perfect complement to match an invisible set engagement ring.